At first, I thought it would make sense to simplify things. I could easily lump my friends in with my family. Many of my family members are friends, so in many cases that would be easy. For work, I could easily get a standing treadmill with an elevated desk for my office, combining the health and work burners. My mind was awhirl with possibilities. I could run with friends. Health and friendship combined. Maybe run a half marathon with friends and family. The family burner added in. Maybe a work weekend with tennis, golf, and swimming. Invite friends, family, and co-workers. Get work done while playing. All four burners at once. By taking some of these to extreme ends it became apparent that life is filled with choices. If I wanted to get real healthy and spend hours in the gym, eat a restrictive diet, and stay away from many different restaurants, my relationships with friends and family may suffer. If I wanted to write a new book, isolation from other people would be a necessity. Sitting for hours at a time is unhealthy, but trying to stand and write fiction for hours doesn’t sound pleasant either. Tradeoffs, it seems, are part of life. The real reason I would want to turn off a burner or two would be to maximize my potential on the others. If I divided my time equally among all four burners, I’d have to accept that I would never reach my full potential in any one area. In our modern society, we want it all. I’m told I can be a best-selling novelist, a top podcaster, a world traveling motivational speaker. I can go to fifty different countries and sample amazing wine and cuisine. I see the seminar experts doing all of these things and more. They say that we can have it all! As I have gotten older, I realize that I can’t become an expert in everything that I want. I need to pick and choose. This simple fact drives me nuts at times. In my mind, I want to be like the celebrities, the gurus, the experts. Except, when I look closer and see that two or three of their burners have completely gone out. They sacrifice family and friends for work. Most are on their third or fourth marriage, with pain, drama, and alimony to pay. I come back to the simple reality that the gurus are lying to us. We can’t have all four burners flame on at once. We have choices to make. We can do some burner maintenance. If one or more of our burners are flickering, spitting or faltering we can do a tune up. We can . . . While I can’t focus all my time on one burner without consequences, I can maximize the time I have for each one. The best way to start is by focusing on important things. Can I box my time to become more productive at work? Can I get up an hour early and workout at the gym before work? Can I meet with my friends at lunch during work? By asking some simple questions you can improve the time you have available for different activities and create positive outcomes. While we can try and do it all, there isn’t enough time in the day to get it all done. With some creative delegation, we can spend our time on what we are good at and outsource some of the rest. By delegating to others, we can add hours to our week that we can spend with family and friends. By cutting back on work hours, we can free up time for the gym or just go for a walk. While some delegation will cost money, others you may be able to barter or trade for. Life rarely allows you to keep all four burners going at once. By giving up on one dream for a short while, you may be able to maximize another. Maybe you need to let a burner go dim for this season. You can do many things in a lifetime, but not at the same time. With four different quadrants, it’s hard to know what burners to keep going and which ones to go dim or out. Each burner has its own control. In my life, I’ve let certain burners go out whack for extended periods of time. I’ve had work burners that burned so hot that they almost caught the entire stove on fire. I’ve had friends and family ones go dim or out for extended periods of time. Unfortunately, I’ve let the health burner just flicker for years, while I gained weight and got badly out of shape. When the work burner flared, so did junk food, to the detriment of my health. The work burner usually requires sitting for long periods of time away from home in stressful situations. This dimmed family relationships and really kiboshed my health burner. In looking back, I definitely needed more control of my stove. I needed a more even flame across all burners. I really need something to regulate the flame . . . The four burners theory isn’t working. With modern technology, many new stoves are coming in different configurations. One of the most popular is the five burner stove. The burners on this stove are in an X pattern. The other burners vary in size, with two middle sized at the back, one large one up front for frying, and one small one for simmering. This gives up many more options than the standard four-burner model. With this stove, you can keep all the burners lit. 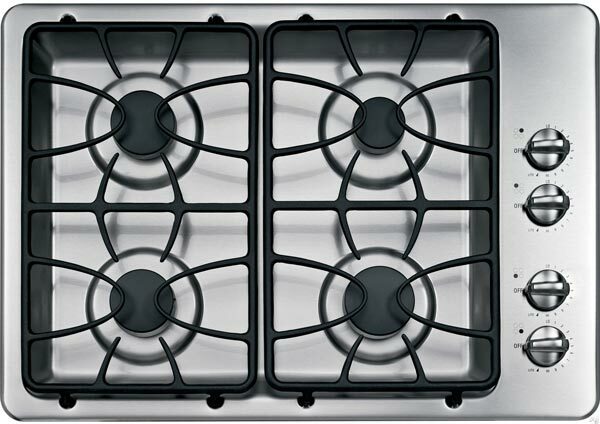 Unlike the four burner model, which would easily go out if turned down much, this stove allows different flame sizes. The central burner is a special one. When used, it helps control the flow of gas to the others. When the stove top griddle is used, it’s the central source of heat. Its heat flows evenly to the other burners, reducing hot spots and keeping food from burning. In our analogy, the central burner is purpose. The stovetop griddle is a balanced life. When you define and designate a purpose in your life, all the other burners come into sync. Like the stove above, you get to designate what goes over each burner. When you add a griddle, the heat is evened out. Your life is better balanced. You can simmer on the bottom right, and cook quickly on the bottom left. Food at the back gets an even temperature. Not too hot, not too cold. Everything Cooking Comes Out Great. With a centered and purpose driven life, you can focus on one area, without the rest of your life going cold. Stress is minimized, and each burner has its own purpose. Depending on the project, or time of life, all you need to do is put the right pot (category) over the right burner and your meal with come out cooked to perfection. The four burners theory is replaced by a five burner one with centralized focus. Many times in life we set up our life in a pattern like the four burner stove. Each burner has its own way. Conflicts arise, drama ensues, and if we are not careful we can catch our whole life on fire. When we set our life in a matrix five X pattern, we have a central focus and the rest of our life revolves around it. 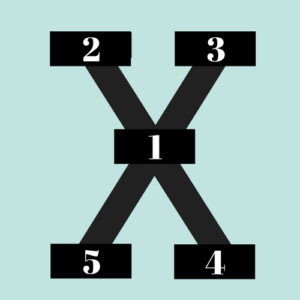 All four corners are affected by the center. Is it time for a new stove in your life? Question: Which burners have you turned off?